We should hope for the Lord’s return based on the prophecies that He Himself spoke. That is the most standard way of waiting for the Lord’s return. Who are you quoting, really? Are you quoting the Lord’s words or the words of men? “Then we which are alive and remain shall be caught up together with them in the clouds, to meet the Lord in the air,” who said that? Are those the Lord Jesus’ words? The Lord Jesus never said anything like that. The Holy Spirit never said that, either. The words you believe in and quote are Paul’s words. Do Paul’s words represent the Lord Jesus’ words? Can he represent God? Only God knows the answer to this mystery. If we corrupt humans dare to make blind interpretations and judgments like this, that’s a serious problem. Paul was not Christ. He was only an ordinary corrupt person. His writings are full of impure human ideas and imaginings. His words are not the truth, so we cannot use them as proof. All proof should be based on God’s words in the Bible. That is in line with the truth. It’s wrong to investigate the rapture and entry into the kingdom of heaven based on the words of people in the Bible, especially Paul, and not based on the Lord Jesus’ words, because only the Lord Jesus’ words are the truth; only His words have authority. Only the Lord Jesus is Christ, the King of the heavenly kingdom. Why don’t you search in the Lord Jesus’ words for the truth and God’s will? Why do you use the words of men as the basis of your search instead? Is this in accordance with the Lord’s will? This makes you prone to following man and walking down your own path. God made mankind out of clay. He tasked them with doing their duty on earth and managing the rest of His creations. He demanded that they obey, worship, and honor Him, and mandated that their place was on the earth, not in heaven. Moreover, God told us long ago that He would establish His kingdom on earth. Besides, He will dwell with us humans on earth and the kingdoms of earth must be transformed into kingdoms ruled by Christ. Therefore, God’s kingdom will eventually be established on earth, not in heaven. Many people are always looking to be raised into heaven. That is their own conception and imaginings, their own fanciful desire. It is not at all in accordance with the truth or the fact of God’s work. Let’s see what the Lord Jesus said: “Our Father which are in heaven, Hallowed be Your name. Your kingdom come, Your will be done in earth, as it is in heaven” (Mat 6:9–10). The Lord Jesus clearly told us that God’s kingdom is on the earth, not in heaven. God’s will shall be done on earth as it is in heaven. Let’s read from Revelation 21:2, 3: “And I John saw the holy city, new Jerusalem, coming down from God out of heaven…. Behold, the tabernacle of God is with men, and He will dwell with them, and they shall be His people, and God Himself shall be with them, and be their God.” Let’s turn to Revelation 11:15: “The kingdoms of this world are become the kingdoms of our Lord, and of His Christ; and He shall reign for ever and ever.” These prophecies mentioned “the tabernacle of God is with men,” “… new Jerusalem, coming down from God out of heaven,” “The kingdoms of this world are become the kingdoms of our Lord, and of His Christ.” This proves that God will build His kingdom on earth, and He will dwell on earth alongside mankind. The kingdoms of the world will all become Christ’s kingdoms, and they will last forever. If we believe God’s kingdom is in heaven based on our own conceptions and imaginings, believe that when the Lord comes He will take us up into heaven, won’t His previous words be in vain? In reality, the final result of God’s management plan to save humanity is the establishment of God’s kingdom on earth. Almighty God—Christ of the last days—does His work of judging and cleansing mankind in order to make a group of overcomers on the earth. Those who obtain God’s salvation, are made perfect and become overcomers are the ones who can practice God’s words and follow His way on the earth. They are the people of His kingdom. After these overcomers have been created, God’s will will be fulfilled on the earth. Then Christ’s kingdom will be established on earth, and God will gain full glory. In the end, He will fulfill the prophecies in the Book of Revelation. Are we still not clear on these facts? What place has the Lord Jesus prepared for us? He ordained that we were to be born in the last days, meet Him on earth when He returns, accept God’s cleansing and be perfected, and become overcomers so that we can do God’s will, and all kingdoms on earth will be made into Christ’s kingdoms. That is God’s will. God comes to earth but we try to go up to heaven. By doing this, aren’t we going against God’s work and His will? If He raises us up into the air, well, there’s no food and no place to live there, how will we survive? Isn’t that all just our conceptions and imaginings? Would the Lord do something like that? The fact that we could think like that, shows that we are really childish. We’re just like having our heads in the clouds! God’s kingdom will be built on earth in the last days. Humanity’s final destination will be on the earth, not in heaven. This has been ordained by God. Almighty God says, “God will return to His original position, and each person will return to his or her respective place. These are the destinations that God and man will respectively reside in after the end of God’s entire management. God has God’s destination, and man has man’s destination. While resting, God will continue to guide all of humanity in their lives upon earth. While in God’s light, man will worship the one true God in heaven. … When humanity enters into rest, it means that man has become a true creation; humanity will worship God from upon the earth and have normal human lives. People will no longer be disobedient to God or resist God; they will return to the original life of Adam and Eve. These are the respective lives and destinations of God and humanity after they enter into rest. Satan’s defeat is an inevitable trend in the war between God and Satan. In this way, God’s entering into rest after the completion of His management work and man’s complete salvation and entrance into rest likewise become inevitable trends. Man’s place of rest is on earth, and God’s place of rest is in heaven. While man worships God in rest, he will live upon earth, and while God leads the remaining portion of humanity in rest …” (“God and Man Will Enter Into Rest Together” in The Word Appears in the Flesh). Almighty God has clearly told us that when His management work is complete, both God and man will enter into rest. God’s resting place is in heaven, while the resting place of us humans is still on the earth. But then, God will lead the remaining people to live on earth. This is a beautiful destination that God has prepared for us humans. It is also God’s kingdom fulfilled on the earth. If we believe in God for many years, but still cannot see this, doesn’t that mean we do not understand the truth or the Lord’s words? Well, what is the rapture really? Most people aren’t quite clear about that. 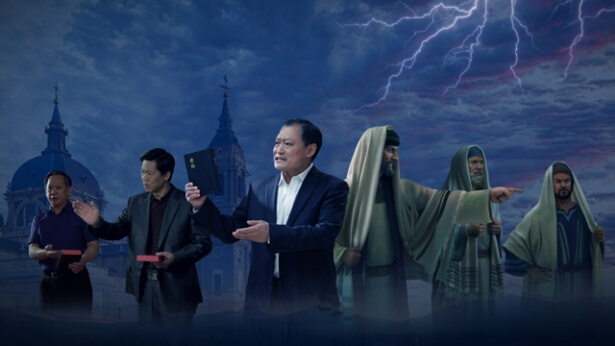 The mystery of the saints’ rapture was only revealed when Almighty God arrived. Almighty God says, “‘Being caught up’ is not being taken from a low place to a high place as people imagine. This is a huge mistake. Being caught up is referring to My predestining and selecting. It is targeted at all those I have predestined and chosen. … This is most incompatible with people’s notions. Those who have a share in My house in the future are all people who have been caught up before Me. This is absolutely true, never-changing, and cannot be refuted by anybody. This is the counterattack against Satan. Anyone I predestined shall be caught up before Me” (“Chapter 104” of Utterances of Christ in the Beginning in The Word Appears in the Flesh). Almighty God’s words are very clear. “Being caught up” is not what we think—being taken into the air from the earth and meeting the Lord in the clouds. Nor is it being taken up to heaven. It means that when God returns to earth to speak His words and do His work, we will hear God’s voice and will be able to follow Him and obey His work in the last days. This is the true meaning of being caught up before God’s throne. All who can distinguish the Lord’s voice, find the truth in Almighty God’s words, accept the truth, and return to Almighty God are the wise virgins. They are the gold, silver and precious stones that have been “stolen” by God and returned to His house because they are all of good caliber and can understand and accept the truth. They can understand God’s voice. They are the ones that have truly received the rapture. They are the overcomers, who will be made when God does His work as He secretly descends to earth in the last days. Ever since Almighty God started His work of the last days, more and more of the people that truly thirst for God’s appearance have recognized His voice in Almighty God’s words. One after another, they have accepted God’s work of judgment in the last days. They have been caught up before God’s throne to meet with Him face-to-face and accepted the watering and nourishing of His words. They have gained true knowledge of God. Their corrupt dispositions have been cleansed and they have managed to live out the reality of the truth in God’s words. They have already obtained God’s abundant salvation. These people have already been made overcomers before the great catastrophes arrive. They have been obtained by God as the firstfruits. Those who hold onto their own conceptions and imaginings and blindly wait for the Lord to come and take them up to heaven, they who reject God’s work of judgment in the last days are the foolish virgins. They are the ones who will be forsaken by God. They are destined to suffer in the disasters; they will cry and gnash their teeth. This is a fact. How should we understand rapture? We use rapture to explain how God saves man from this realm and under this domain and places them in that realm and under that domain. However, whenever people think of rapture, they imagine it as being carried up into the air. Isn’t this erroneous? If, for example, you were born in a backward, remote village and subsequently you were assigned to work in a large city, we would describe this in the language of mankind as having been elevated from a remote village to work and live in a large city. Isn’t this the meaning of being elevated? Is that elevation different to being lifted into the air as imagined by man? Which of these is reality? Rapture refers to being raised from one kind of realm into another kind of realm—this is elevation! This elevation is not being raised up high above the ground, or being raised from the ground into space, that’s not what it means. Rather, it refers to being raised up to an even higher level, to an even higher position, an even higher-class place. This is elevation. For example, we were originally peasants and workers from the lowest level of corrupted mankind, with no social standing, looked down upon by others, suffering suppression and exploitation, without the right to speak, and now at a stroke we are raised up as the people of the Age of Kingdom—have our positions not been elevated? Originally, we were corrupted mankind, the lowest level of mankind in the dark, evil world, and now suddenly we are raised in rapture to be the people of God’s kingdom, people who are citizens of the Age of Kingdom. If we are raised up to be the people of the Age of Kingdom, isn’t this rapture? This is real rapture. Well, some say: “Am I not still living there? Am I not still doing that work? Hasn’t what I eat and wear also not changed at all? Why don’t I feel like I’m up high?” Whether or not you have been raptured cannot be determined by how high or low you feel. When the day comes when this fact will be revealed, those whom you believe to be high up will be destroyed, and though you may think you have obtained nothing, you will be one who remains; how will you explain it? This meaning of the people of the kingdom is true. A day will come when this fact will be validated. At that time, you will say: “Oh, I have really been raptured, but I wasn’t aware of it, God’s work is so wonderful.” If they do not have the truth, people will be unaware of this rapture, they will live in blessings without knowing how blessed they are. When the great disasters come, God protects you and no disasters will befall you; does this not explain that now you have already been raised up in rapture, that you are God’s chosen people, people of the Age of Kingdom? Does this not explain this issue? One day you will acknowledge that “This is a fact, my status is certainly different. Although people in the world regard me as still a worker or a peasant, in the eyes of God I am a person of the Age of Kingdom; therefore I really have been raptured and I am already enjoying the grace of rapture.” This is the practical meaning of rapture. If you do not understand that which is called rapture and, relying on your own imagination, you believe that rapture is to be raised up into the air, well, you just wait to be raised up into the air then. Next：Question 2: You bear witness that God has become flesh as the Son of man to do the work of judgment in the last days, and yet the majority of religious pastors and elders maintain that the Lord will return coming with clouds. They base this primarily on the Bible verses: “This same Jesus … shall so come in like manner as you have seen Him go into heaven” (Act 1:11). “Behold, He comes with clouds; and every eye shall see Him” (Rev 1:7). And furthermore, the religious pastors and elders also teach us that any Lord Jesus who does not come with clouds is false and must be rejected. So, we’re not sure whether or not this view is in line with the Bible; is this kind of understanding correct or not?